Israelite Kings Depicted in Ancient Art? Has archaeology uncovered portraits of two Israelite kings? One contender is on the famous Black Obelisk from Nimurd/Calah, but scholars differ about the identification. Another more recent candidate for an Israelite king’s portrait is an image from a wall at Kuntillet ‘Ajrud, a remote site in the Sinai desert. I Am Ashurbanipal, featured at the British Museum in London through February 24, 2019, is a magnificent exhibition. 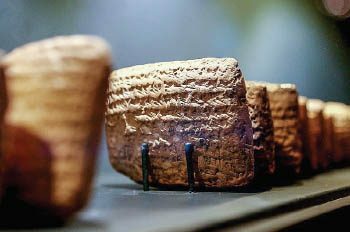 How Bad Was the Babylonian Exile? Was there really weeping from the Judahite exiles by the rivers of Babylon? New evidence suggests that life was actually pretty good for some Judahite deportees and their successors. Seeds and fruit remains are exciting discoveries for archaeologists, and they provide radiocarbon data to help date buried strata. Fruit also plays an important role in the Biblical narrative. Carchemish was an important Hittite fortress and provincial capital located on the west bank of the Euphrates River. From the comfort of your home, you can virtually explore archaeological objects that shed light on Biblical history with the click of a button. The tomb of the Biblical prophet Nahum in northern Iraq will survive to see another day. A recently translated Old Babylonian flood tablet describes how to build a circular ark.